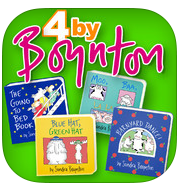 I got some apps for cheap today: the most exciting of which is a half-price set of Sandra Boynton Apps, which includes the Going to Bed Book, Moo, Baa, La La La, Blue Hat Green Hat & Barnyard Dance. I also got But Not The Hippopotamus, Tacky’s Christmas and Merry Christmas Mom & Dad. Also on their way to me are a Nexus 7 and a new Kindle Fire because a lot of libraries seem to be going with Android devices of various sorts and I want to figure out a good mirroring mechanism for use in storytime. Has anyone figured this out yet? Posted on December 2, 2013, in Literacy. Bookmark the permalink. 3 Comments. Cen, you can mirror with an iPad2 or higher on a projector or TV (and smartboard also, I think) w/the proper Apple adapter (a cable which costs about $29). Don’t know about Android devices. Hi Roxie! Yes; iOS device are all set for mirroring wirelessly (and wired with dongles), and I had high hopes that Chromecast would do the same for Android, but it’s only for browser-based content thus far. I’m waiting for the Android equivalent of AppleTV!